The FIM (Fédération Internationale de Motocyclisme)/UEM (Continental Union for Europe) has just published its latest Public Policy Newsletter. The newsletter reports on subject such as the airbag jacket, Italian schools programme, Crete – helmet campaign update, UN Decade of Action for Road Safety events, FIM Experienced Rider Training Symposium – Canada, Prologue Project a road safety research programme, Responsible tourism. But interesting is the opening comments in the newsletter by Achilles Damen, Director of the Public Affairs Commission (CAP), FIM and Jean-Pierre Moreau, President of the Public Affairs Commission, UEM (FIM Continental Union for Europe). 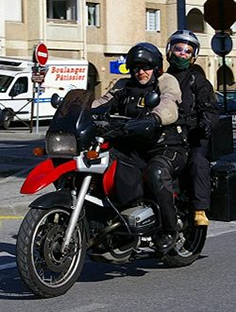 There has been a lot of furore in France regarding the apparent proposals by their government to introduce the compulsory wearing of high viz clothing or devices for motorcyclists. Achilles Damen asks some reasonable questions and offers sensible advice which we haven’t come across in the present rhetoric on the issue. The comments also tie in with clothing regulations as regards protective clothing. Mr Damen suggests that the real problem that should be addressed are those who ride in who ride around with nothing but a tee shirt, shorts and flip flop shoes. Although this is directed towards those European countries that enjoy a much more “heat orientated” climate, in Northern Ireland a couple of days sunshine will see riders in tee shirts, shorts and no gloves and while that is their prerogative, at Right To Ride we can’t help but cringe and thinking ouch! In consideration of riding across borders, Right To Ride asked the RSA in Ireland and the UK’s Parliamentary Under Secretary of State for Transport Mike Penning a couple of questions regarding mandating the wearing of HiViz/Day Glo jackets/vests and the compulsory wearing of compulsory protective clothing by motorcyclists in the UK. First we asked the RSA for clarification if the proposals in their 2009 consultation regarding the compulsory wearing of high visibility upper body clothing with full sleeves for riders and pillion passengers are being introduced into Ireland. While we have had an initial response from the RSA that states, “Regarding the using of Hi-Vis clothing , Action 8 requires the Road Safety Authority to provide such clothing to increase wearing rates and to promote their usage (Action9). There is no reference to compulsory wearing. The response continues “in the actions (Action 23) there is a plan to introduce compulsory wearing of Personal Protective Equipment (PPE) scheduled for the end of 2014. However Actions 24 requires the Road Safety Authority to promote the usage of such clothing on an annual basis and Action 25 requires the authority to carry out a comprehensive research project on the matter. This research is ongoing at the moment. Well no, not really! In fact we’re now completely bamboozled! It seems to us that there appears to be a contradiction from the RSA which is leading to more confusion about whether hi-viz will be made compulsory in Ireland. We have asked if this could be clarified and voiced our concerns that if Hi-Viz or PPE clothing are made compulsory in the ROI (Republic of Ireland), then motorcyclists from Northern Ireland or from any other country for that matter, would then have to comply with the regulations in the ROI. These may not be a legal requirement in UK or in other European countries for riding on the road. We wrote that this would thus suggest that foreign motorcyclists would be open to prosecution for non compliance if travelling in the ROI. 1. Are there any plans to introduce in the UK to mandate the wearing of HiViz/Day Glo jackets/vests for motorcyclists? 2. Are you aware that the European Commission is planning to introduce legislation so that member states will have to introduce the compulsory wearing of HiViz/Day Glo jackets/vests? 3. 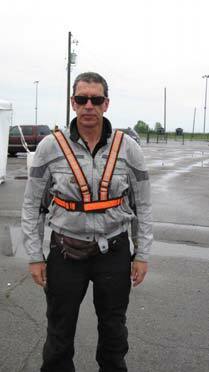 Are there any plans to introduce the wearing of compulsory protective clothing by motorcyclists in the UK? “The importance of wearing the right clothing has been part of the Safe and Responsible Riding Syllabus and the CBT syllabus for many years. And examiners turning candidates away from test for wearing inappropriate clothing is not new. Representatives of the motorcycle community have been involved in developing guidance to new riders and also the Syllabus. Only those candidates who are wearing wholly inappropriate clothing should have their tests cancelled. Our (and DSA’s) aim is to reinforce the message that learner motorcyclists should take their safety seriously while riding, including during the practical test. It is for individual member states to set requirements on the use of vehicles in their country and there are no plans to change our laws simply because another member state chooses to do so. The reply from the DfT regarding compulsory clothing focuses around concerns that the DSA (Driving Standards Agency in GB) has reminded motorcycle test candidates to wear suitable clothing – which contrasts with the Motorcycle Action Group (MAG UK), suggesting that “the spectre of compulsory protective clothing comes one step closer”. However if the EU decide European wide to try to introduce mandatory hi viz or compulsory clothing then we hope that the UK Government and elected MEPs will fight our corner! The road safety authorities in Ireland have been handing out Hi Viz to riders and in the UK, Motorcycle News (MCN) reported in February that police force in England were issuing, either a high-visibility jacket or bib and rucksack as well as leaflets which were designed for all road users but contain messages relevant to motorcyclists in respect of speed. While MAG Ireland opposes the mandatory wearing of hi viz, MAG Ireland and is not against the use of high visibility clothing, they have recommended for example a reflective purple “H” belt as the visual impact of this is much greater, they also believe that hi-viz colours need to be assigned to different classes of road users e.g. builders – orange, emergency services – green et cetera so that other road users will associate the various colours with the type of hazard that could be connected with them. So whether you choose to wear a hi viz jacket, vest or belt, whatever colour they are, or buy these yourself or they are given away free, at present as a motorcyclist with a full licence, it is your choice. While the DfT in GB has said that there are no plans to make Hi Viz/Day Glo jackets/vests and protective clothing for motorcyclists compulsory, here in Northern Ireland we can keep an eye on the issue. In its road safety strategy to 2020, the Department Of the Environment (DOE) only considers measures to improve the visibility and conspicuity of motorcyclists. However the newsletter finishes with comments that might be seen as conversional regarding policing for those in the minority who still behave “stupidly” that, “there is always the application of some effective policing. Officers can still stop riders and advise them and their passengers. While doing so they are fully entitled to run some checks on driving licence, insurance etc. Experienced police officers know that those who are irresponsible in one area of life are almost always irresponsible in other ways too”. Suggesting that experienced police officers are capable of knowing whether a person is irresponsible just because the way they are dressed, is a dangerous statement. I was involved in an accident where a 4×4 crashed into the back of me whilst I was stationary on my bike, 8 months sick and invalided out of the sevice, driver didn’t see I had stopped, so perhaps the advocates of compulsory hi vis have a point, oh hang on, I was on duty on patrol on my white police bike with enough hi vis to be seen from the moon, complete waste of time, the guy was on the phone, compulsoty lights/helmets/hi vis/cotton wool wrapping, are just stepping stones to banning bikes, make the most of it while you can. Over 1,000 of you have now voted in the MAG Ireland poll on mandatory high visibility clothing. The results deliver a stinging rebuke to the RSA’s proposal with more than nine out of ten saying “No” to mandatory high-viz..
MAG Ireland would like to thank the dozens who e-mailed the office with your personal experiences of high visibility clothing, both positive & negative, and also those of you who invested time and effort in this debate. We’re aware that a substantial number of you already wear high visibility clothing when you feel it may have a positive effect, particularly during the hours of darkness and in poor weather conditions. We’re campaigning for your right to retain that choice. In it, we (MAG Ireland) get into the specifics of the RSA proposal, and we take a detailed look at what exactly high visibility clothing is and how it works because the RSA themselves have said that they propose to consult on the type of material to be used. For journalists, bloggers, and others in the print media the information sheet provides a concise synopsis of the current situation in a readily readable format. “there are no plans (or inklings of plans) to introduce a mandatory hi-viz requirement for motorcyclists in Northern Ireland”. Funeral directors at more than 100 churches across County Mayo in Ireland will be given hi-vis vests to distribute to volunteers who marshal funeral traffic. Mayo County Council is issuing the vests with the aim to increase the visibility of the marshals who are often situated on unfamiliar, remote and dark lanes. Noel Gibbons, road safety officer with Mayo County Council, says: “With clocks going back in a few weeks, we felt it was an opportune time to begin a road safety campaign. As evenings become darker people should remember the importance of being clearly visible to drivers. “Despite the falling number of road deaths in recent years, there are still too many people losing their lives on Irish roads. We need to take every precaution to protect ourselves. Concentration by all road users can prevent these deaths. “Visibility can be hampered during the winter months; therefore, it is important that we take responsible measures. Pedestrians can take a simple first step by wearing hi-vis vests. They may not be fashionable but they do save lives. For more information contact Noel Gibbons on 0877870055. Our friends over at Back Roads Rider have just put up an article on Hi Viz. An Article from FEMA on the FIM article – Motorcyclists and Mini Skirts! “…….And women should never be barred from wearing mini-skirts.”………………………………. ‘Hi vis’ clothing works extremely well providing the other road user looks at you! ….. And that’s the problem and always will be! Research on the pros and cons of conspicuity aids is being done on the issue at places like the Transport Research Laboratory, and the results do get handed onto the DfT, but there is an entrenched problem that being bright = being visible which goes right back to the days of “wear white at night” Public Information Films; it’s hard to overturn 50 years of tradition! It appears that bureaucrats are falling for the same old stuff, and failing to comprehend what actually might be happening. Good on RighttoRide for staying on top of this. OK, lots of attention has been paid to the apparent difficulty of auto drivers seeing motorcyclists, and the typical suggestion is for the motorcyclist to make himself or herself more conspicuous. The logic is that drivers don’t see us because we aren’t conspicuous enough. The responsibility is handed off to the motorcyclist to do something to help other drivers avoid running over us. However, let’s note that “seeing” a motorcyclsit is more than a matter of the driver’s eyes picking up the bike. The eyes simply pass along the view to the brain. And the human brain has all sorts of hard-wired trickery–including inattentional blindness. That’s where a person fails to comprehend something because they weren’t attending to (thinking about) it. That’s why drivers can pull across the rails into the path of an oncoming train, or pull out in front of an approaching fire engine–both with horns blaring and lights flashing. The best case scenario is that at any time in traffic, around half of those other drivers will see you. The other half won’t—even if you are wearing a self-illuminating costume pulsing with bright flashes. If that’s true (and I believe it is) then the only way to avoid a collision is for the motorcyclist to comprehend what’s happening, and get out of the way of errant drivers (and also cattle on the loose, bicyclists, buckets of paint falling off lorries, and airplanes falling out of the sky). Strapping on a high-viz jacket, vest, belt, etc. will help those drivers who are merely blind or not really watching the road. It won’t help those who are inattentionally blind. Nor will it help the rider who is dumb enough to hide behind a larger vehicle. My point is that avoiding collisons is far more than wearing high-viz gear. 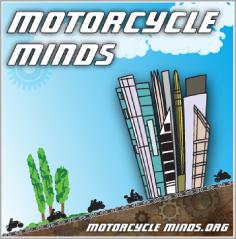 I have little trust that a bureaucrat will be able to comprehend what’s involved in motorcycle safety, let alone craft laws that will actually reduce the motorcycle fatality rate.